There are 350 different species of parrots in the world. Many parrot species kept in captivity because of they are very colorful, intelligent and playful. The Amazon parrots, African Grey, Cockatoos and Parakeet species of parrots are also have great communication skill. Here the list of 10 most beautiful parrots in the world. 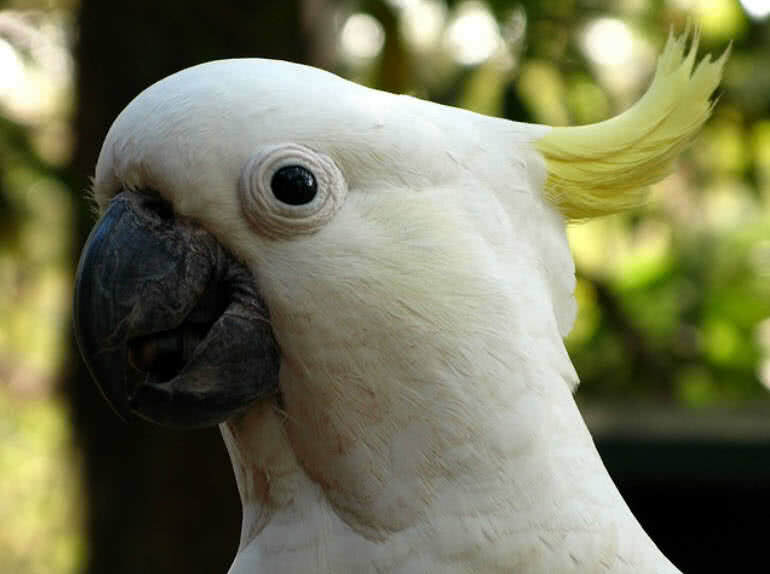 The sulphur crested cockatoo is a large beautiful species of parrot. They are known for their distinctive sulphur-yellow crest. They live in Australia, New Guinea and Indonesia. This species has a length between 17-25 inches and white colored plumage. The dark brown bill of sulphur crested cockatoos are also remarkable. The male and female birds are almost alike. The main difference between them is the color of eye, the female has red brown eye and male bird’s are in dark brown color. They also have a variety of loud calls. Sulphur crested cockatoo make nest in hollows of trees. This iconic parrot species live up to 70 years. The family group of sulphur crested cockatoo also stays together for many years. They mainly feed on berries, seeds, nuts and roots. Bronze-winged parrots are medium-sized unusually colored parrot species native to South America. Their plumage is in dark purple or blue coloration and have a bronze patch on wings. The feathers of this species have violet edges and throat is in pink. It also a sociable, calm and beautiful pet parrot. Bronze-winged parrots are intelligent and playful. They can mimic with proper training. in Wild they used to live in tree cavities. The breeding season of bronze-winged parrot start from March to June. The female bird lay three or four eggs and incubation last for 36 days. The extremely active and playful dusky lories are one of the most popular pet parrots in the world. The intelligent dusky lories also mimic human speech very well. They also like to play with toys are interact with people. 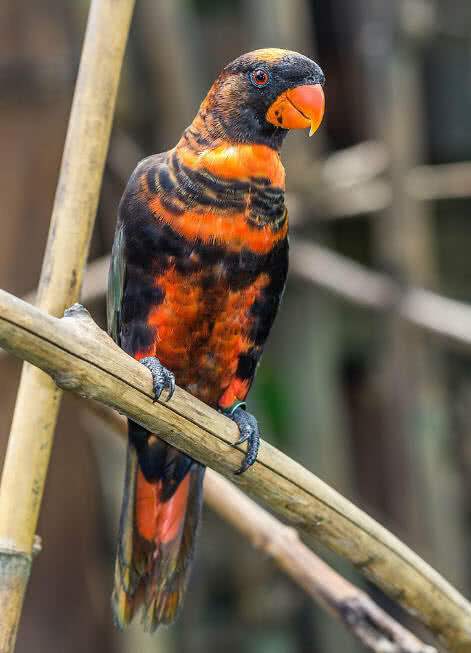 Dusky lories are originated from Papua New Guinea and also called as white-rumped lory. The dusky lories have length up to 9.5 inches and weigh between 9.5-10.5 oz. The male and female bird look alike and has bright orange colored upper chest, cream colored rump, grey legs and dark orange colored beak. They inhabit in tropical and subtropical forests of Papua New Guinea. The diet of dusky lories consist of fruits, nectar and seeds. 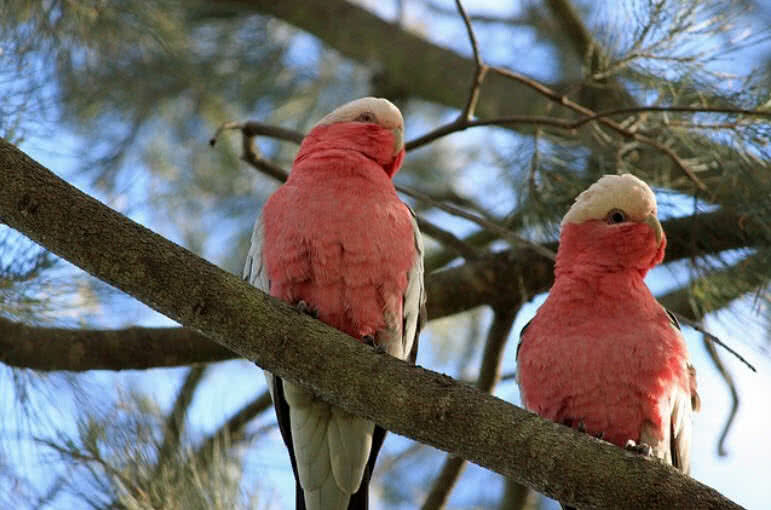 The beautiful galah parrots are identified by their pink chest and face. Galah parrots are also called as rose-breasted cockatoo and galah cockatoo. They found across almost all regions of Australia. Galah parrots are also highly social species, found in large flocks. The galah parrots reach up to a length of 14 inches and weigh between 270-350 grams. Their upper part and short tail is in grey color. The male and female birds almost look alike, although the color of male bird’s eyes is dark brown and it is pinkish red in females. The large flocks of galah parrots include up to 1000 birds. They often perform acrobatic flight in the sky. The galah flock also travels for long distances in searching for food. 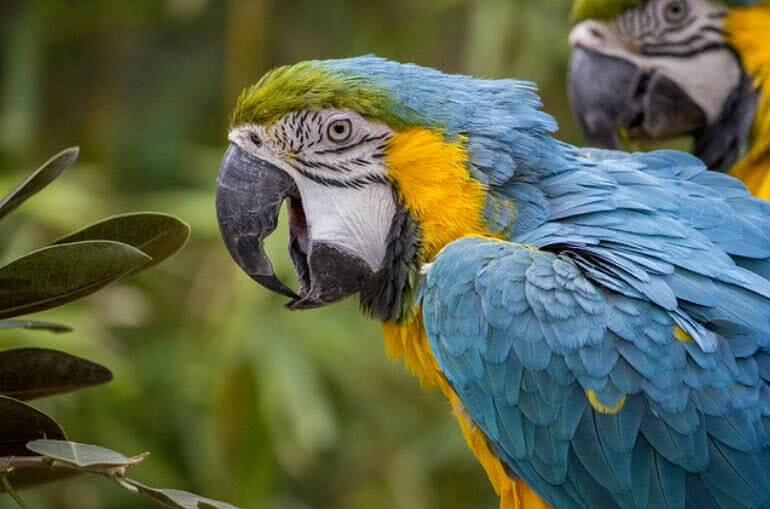 Blue and yellow macaw is a large and beautiful parrot species native to South America. They inhabit in humid forests and swamps. They have blue upper part and yellow underpart. The striking color and talking ability also make blue and yellow macaws as one of the most popular pet birds. This species of parrots are extremely social and intelligent. They love to interact with people and learn different tricks from their owners easily. African grey is the most intelligent talkative parrot species in the world. 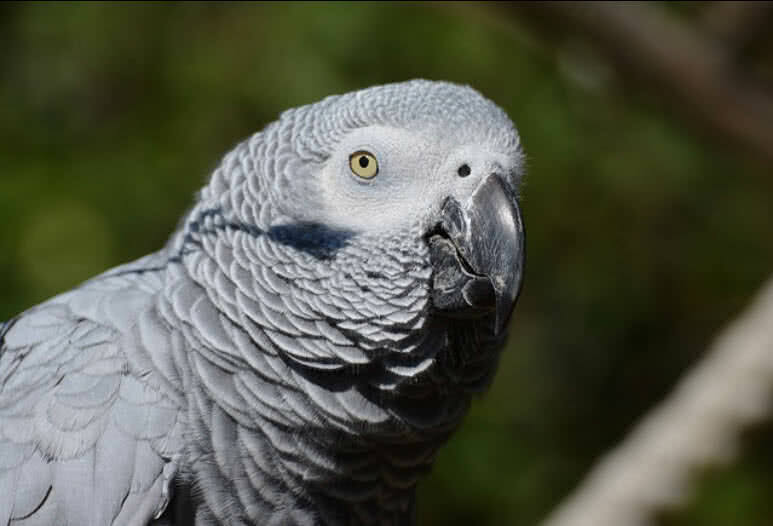 The bond with owners let African grey to excel in talking.As the name indicate African grey parrots are endemic to Congo of Africa and in grey coloration. They have a wingspan between 46 cm and 52 cm.The male and female African grey look similar. 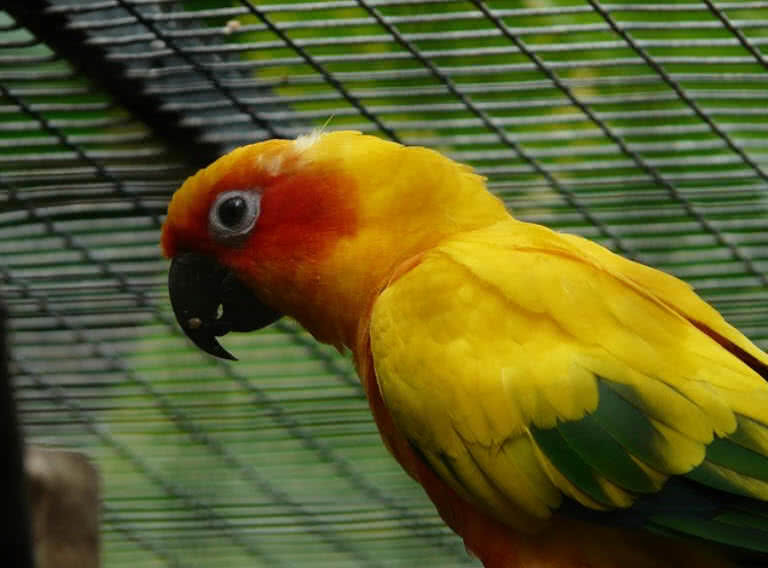 Sun parakeet is an attractive and endemic parrot species native to South America. Their amazing plumage display yellow, red,orange, blue and green colors. Sun parakeet also has a white patch around the eyes and green marking on the wings.Like a number of other parrot species both male and female parakeet look alike. They are also known for mimicking the human voice. 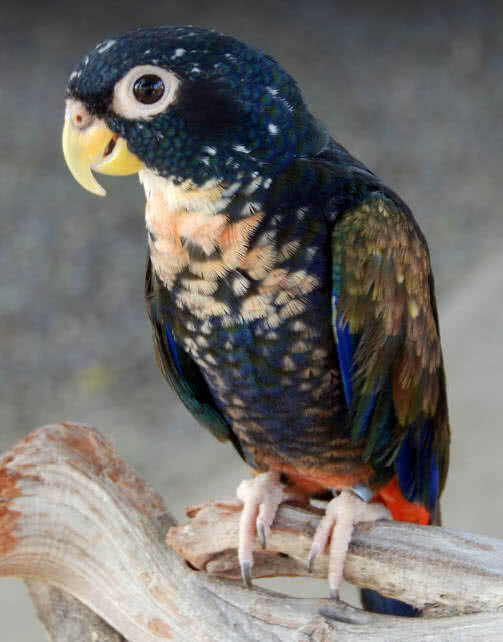 Unlike adults the juvenile Sun parakeet has olive green coloration. It changes to a mixture of different bright colors after they become 6 months old. They make groups that contain up to 30 birds and feed on berries, fruits, nuts and flowers. 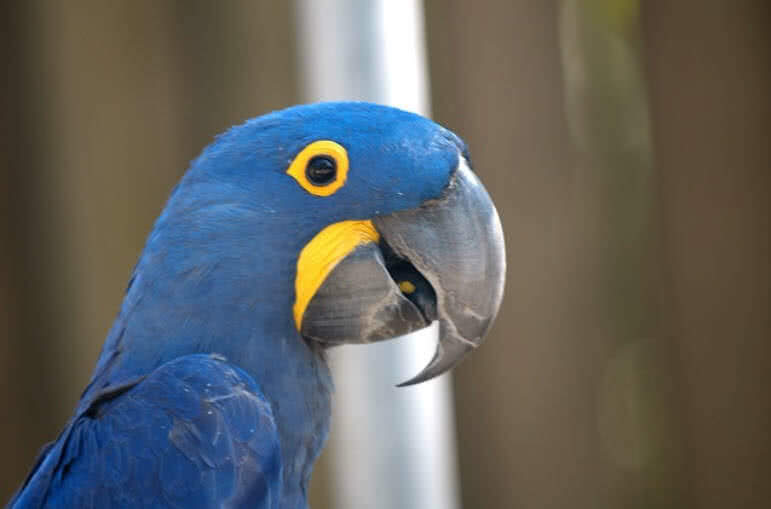 Hyacinth macaw is the largest flying parrot species in the world with a length of 40 inches. It is an endangered parrot species and the surviving members are mainly found in Southern Brazil. They have bright blue plumage and large beak. The intelligent hyacinthine macaws are also known for using tools with the help of their large toes. The eclectus is a strikingly colored parrot species native to Papua New Guinea. The male parrot has bright green plumage and female birds display bright red and purple coloration. This sexual dimorphism in plumage color also make eclectus as an unusual parrot species. Another notable change between both sexes is the coloration of the beak. 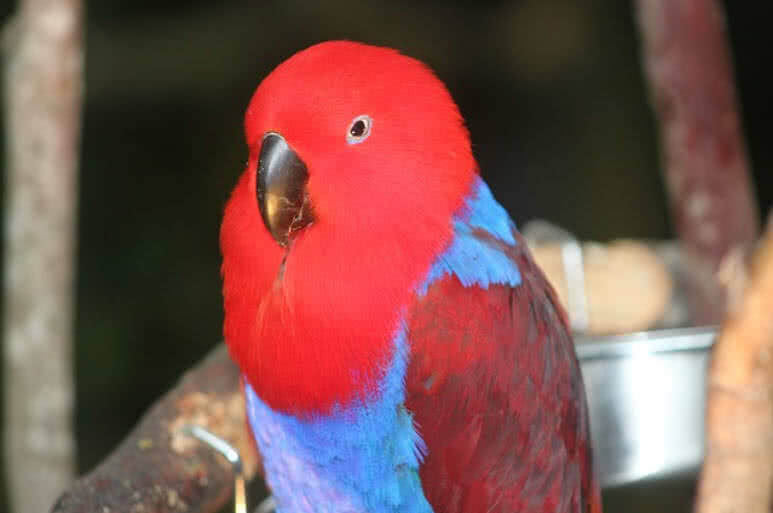 The beak of male eclectus has orange upper part and a yellow tip. In case of female bird the beak is in black color. The eclectus are also one of the best pet birds in the world. They are very calm social birds. Eclectus parrots show their communication skill in an entirely different way than other species of parrots. To express excitement and threat eclectus parrots raise their head feathers. They also have lifespan up to 30 years. he upper part of scarlet macaws are in white and the lower part is in black. This intelligent parrot species show the excellency in mimicking a number of words and voices. They are also smart enough to learn different tricks from their owners through proper training. They can even recognize different shapes and colors. 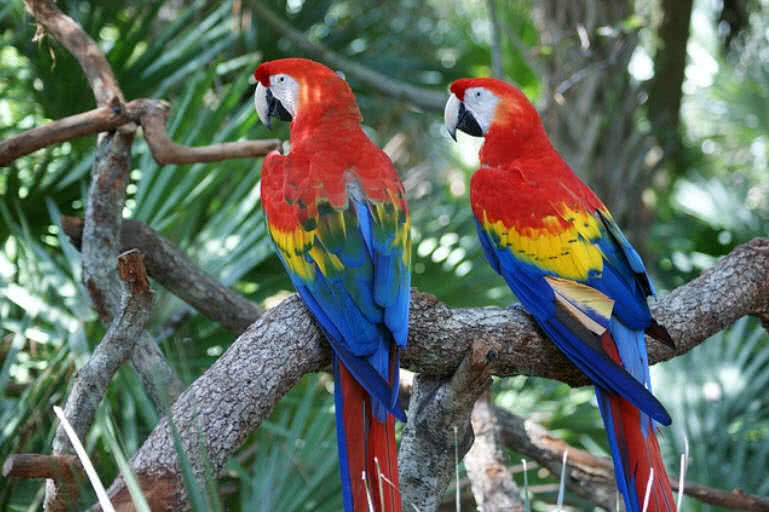 The scarlet macaws also have long life expectancy, between 40-50 years.